Work with object ownership in an app. We need a web service that feeds data for a social media app. The topic we’re testing is the ability to work with data that may be private to its owner. We need a web service that enables registered users to create hobby or craft “projects”. Each project can have associated media items (e.g. photo, video, etc.). The inspiration for this idea was apps like Pinterest or Trello. A user’s project can be private, public, or shared. A shared project can have a collection of users, who can contribute media items to the project. The web service trusts an IA Server, which will perform identity management tasks, and authentication. A user of the web service must obtain an access token from the IA Server before they can access secured resources. The web service trusts an access token that’s generated by the IA Server, so it can validate the token. In the GitHub code example repository, there are two projects that you can use as-is for this assignment. The IAServerV2 (version 2) project is in the Week 9 folder. Get that, and use it as your IA Server. The Assign10Base project is in the Week 10 folder. Get that, and use it as a base, or foundation, for this assignment. Using the controller method in the IA Server project, generate a new machine key value. Then, add this to both apps. Remember to customize the home controller’s index view with your personal information, and the _Layout.cshtml view template with the application name. Do this for both projects. Build/compile, and run (without debugging), to ensure that each app’s home > index view loads in a browser. It has two entities in its design model. Click the image to open it full-size in its own tab/window. In Visual Studio, use the Task List to inspect the code that’s been highlighted with the “Attention” comment token. Study the features of the app. Notice that the app currently works in a way that allows a user to work only with objects they have created. However, you will make a small change (described later) to that functionality. Inspect the logic chain that implements this, including the controller methods, and manager methods. Before you begin coding, plan your authorization strategy, and your query and data access strategy. Write them down, so that you don’t forget this information. Each use case will be enabled by a specific combination of query terms. How can you think about the use cases and object relationships? Well, consider this example. Remember, the app is designed to enable a user to create and maybe share a hobby or craft project. The app enables many human users to register for an account. Each user is able to create (zero or more) projects. Each project can have (zero or more) media items associated with it. 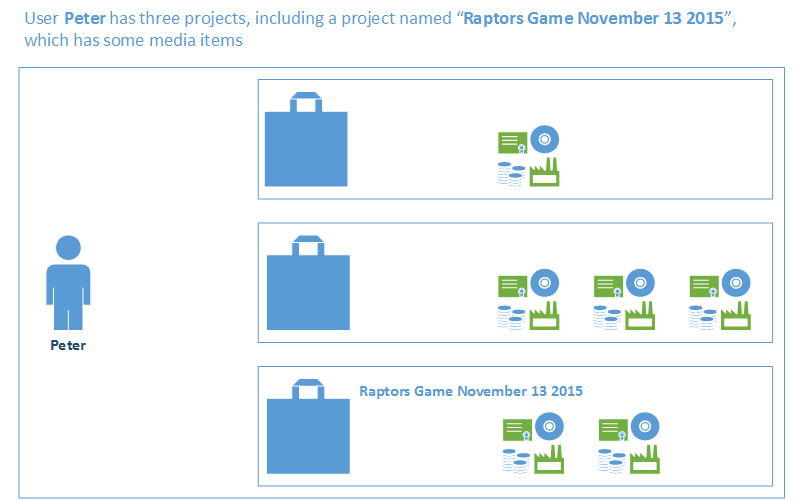 Assume that the user named Peter created a new project named “Raptors Game November 13 2015”. It was created as a “Shared” project. The project will initially be visible only to Peter (because Peter created the project). Two photos were added, associated with the project. Maybe they’re game action or selfies; whatever. Later, Peter talks to another user named Marie, and learns that Marie also went to the game, and has some photos. Peter decides to share the project with Marie, so that she can view the project and its media, and also contribute her photos. Next, Marie adds two photos, associated with the project. The project, and its media, is visible to Peter and Marie. Both can add photos and other media items. Your app will need new users with specific claims. Each will include a new custom claim named “Task”. It can have a value of “ProjectView” or “ProjectContribute”. Therefore, in the IA Server app, add these claims to the master list of allowable claims. Then, plan to add some users (with claims), but do the planning first. Write these down somewhere. Maybe use a simple table as an organizing device, as in the example below (use your own name and your friend names!). We suggest that you use real names. Use your own name (maybe as the project owner), and names of 3 or 4 friends. This will make it easier to visualize the people involved, and what they are doing in the app. For the custom claims (“Task”), we suggested (above), you can use “ProjectView” and “ProjectContribute”. You can also design some other custom claims (“OU” or whatever). See the example above. Then add these new users, and their claims, using the IA Server “api/account/register” endpoint. As noted above, a project owner can decide to share a project with other users. For each user, the project owner determines the kind of access the user has to the project. Initially, the two access levels will be “View”, which should be self-explanatory, and “Contribute”, which indicates that the user can contribute a media item to the project. A new entity class (perhaps named Sharer) is needed to store the user name and access level. Both will be string properties. A project will have a to-many association with Sharer, which means that a project can be shared with zero or more users. At the other end of the association, Sharer has a required to-one association with Project. It should also have a date-time property, perhaps named DateUpdated. You should be able to figure out whether its date-and-time value is supplied in the request or set by the app’s logic. Next, the Media entity needs to be modified. It needs a “Contributor” string property, holding the user name of the user who created the media item. Here’s what the updated design model could look like. Click to open it full-size in its own tab/window. Build/compile your work so far, to ensure that there are no errors. Next: After you modify the Media entity, consider whether its resource models need modification. Yeah, you should probably do that work now, before moving on. So… the original “Assignment 10 Base” app allowed a user to create a “project”, with “media” items. Your work will open up the ability for a friend (sharer) to view a project, and maybe contribute media items. We will have to re-visit the use cases, to make sure that the logic/coding changes will do the job. Here’s a summary table that you can use to guide your work. After the table, some guidance and suggestions are offered to help you complete the work. 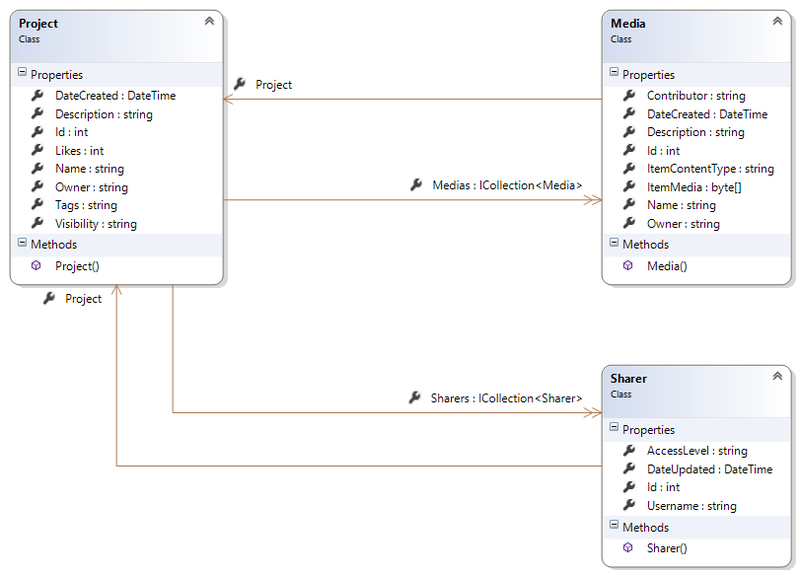 The original base project has controller methods that work, but they do not have all the authorize attributes shown above. It’s also possible that the manager methods don’t have all the user / identity checks that are needed. Therefore, the first task would be to edit the existing use cases in the original project to match the plan. Let’s do the easy ones first: Project get-all and add-new, and Media get-all are easy to change, they just need authorize attributes. The others need logic changes. Before doing those, we will enable project sharing. Enable the owner of a project to share it with another user. We suggest that you implement this as a command (i.e. a PUT request) in the Project controller. Place the username, the access level, and the project identifier in the request body. This implies that you need a new resource model to hold the username, the access level, and project identifier. The app logic will then cause a new Sharer object to be created. It should check for an existing sharer object that has a matching username, access level, and project. Don’t create a duplicate. Note: We do not really need a Sharers controller in this assignment. Now we’re ready to edit the remaining use cases. After you have created your “app service” (web app) for your Assignment 10 work, you will have a URL to the site (on azurewebsites.net). Before deploying to Azure, edit the Home controller’s Index view, and add a nicely-formatted hyperlink, using the URL (above). That way, when we check/grade your work, we have the URL to your Azure-deployed app. Detailed instructions for Azure deployment will be published within a few days. If you need help, your professor will help you with deployment early next week. Test all scenarios (use cases). Make sure that you test error or error-like scenarios. The export format will be “HTTPArchive v1.2”. Click the Next button to choose a save location (your project’s root, in the same folder level as the “packages” folder and specify a filename. Name the file by using the project name (e.g. “<whatever>.har”). This Assignment 10 has a modified submission process (when compared to earlier assignments). For example, assume that you are currently viewing a folder named “A10” in File Explorer.